Ramps from Interstate 70 join Interstate 635 south at the Kansas River Bridge. The pair of three lane bridges were completed in 1976, but are not fully Interstate standard due to narrow shoulders. Photo taken 06/18/15. 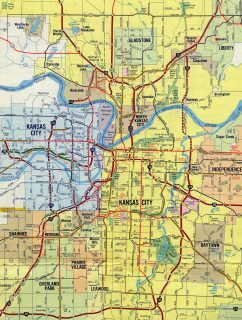 Interstate 635 in Kansas and Missouri provides a western bypass of Downtown Kansas City and truck route between Merriam, Kansas, and Interstate 29 in north Kansas City, Missouri. The freeway serves the Santa Fe and Fairfax Industrial District on the Kansas side of the Missouri River and Horizons Business Park in Riverside, Missouri. 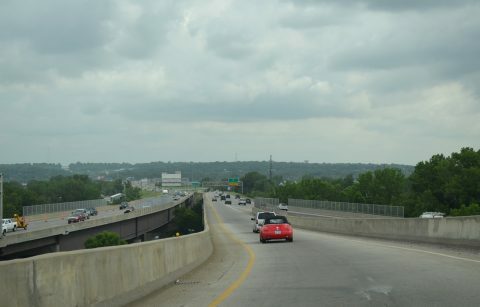 The urban route also serves the Argentine, Quindaro Bluffs and Turner residential areas of Kansas City, Kansas. The southern terminus of the freeway ties into U.S. 69 (Metcalf Avenue) south into the commercial center of Mission. The exit number sequence for I-635 in Kansas continues northward into Missouri. There are no control cities for the freeway in Kansas and signs on the Missouri side simply reference the state of Kansas. 2015 traffic counts along Interstate 635 in Kansas peak at 77,200 vehicles per day (vpd) on the segment between K-32 and I-70 & U.S. 24-40. The Missouri side of I-635 saw counts range from 49,125 vpd at the Missouri River to 53,542 vpd south of I-29. Missouri submitted Interstate 635 to AASHO as part of its proposed Urban Route Numbering on July 31, 1958. 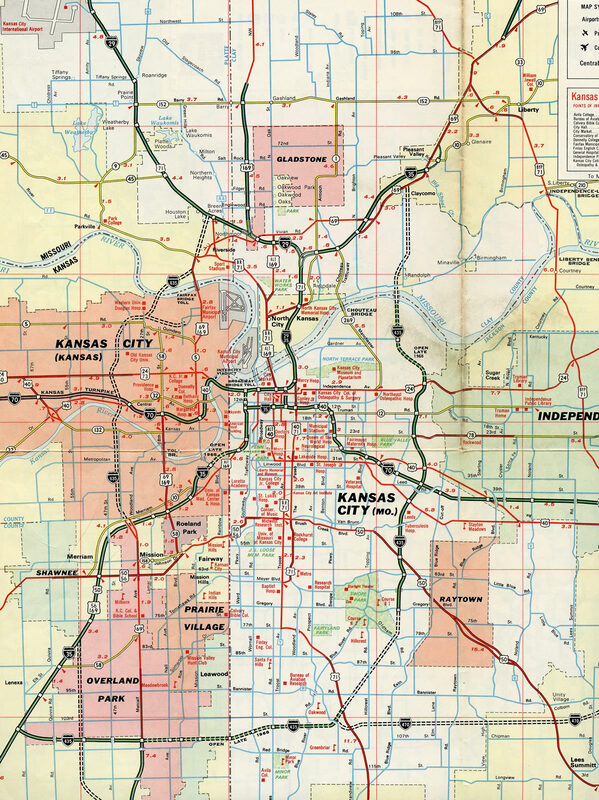 It was approved along with I-435 (Kansas City Eastern Beltway) and I-470 on November 10, 1958. The November 1958 plan for I-635 took the route eastward along the K-5 freeway spur to U.S. 69 (7th Street), and along U.S. 69 to the Platte Purchase and Fairfax Bridges across the Missouri River toward I-29.1 This was shifted westward to a new alignment after 1968 when additional federal funding would pay for a new Missouri River crossing. Construction of Interstate 635 began in 1969.2 The freeway was complete in 1975 from I-35 north to Kansas Avenue (K-32 / Old K-132), from State Avenue (old U.S. 24-73) north to Leavenworth Avenue (K-5 west), and from the Fairfax Bridge (U.S. 69 / Old U.S. 169) northward to I-29 & U.S. 71 in Riverside, Missouri. I-635 was finished by 1977. A new diamond interchange (Exit 1) with Horizons Parkway opened to traffic in December 2007 just north of the Missouri River. The exit serves the Horizons Business Park and Argosy Casino. Horizons Parkway was built northward from I-635 to Missouri 9 in 2008,3 while Argosy Parkway was extended west to Exit 1 in 2009. The proposed route of Interstate 635 in 1968. The initial alignment for I-635 was slated to use the 1933-built Fairfax and 1957-built Platte Purchase Bridges across the Missouri River. The narrow spans for U.S. 69 were eventually replaced during atwo-year project through December 2016. A short section of Interstate 635 was open by 1972 between State Avenue (former U.S.24 &amp; 73) and K-5 (Leavenworth Road). K-5 accompanies Interstate 635 between Exits 7 and 8. The K-5 freeway spur east from I-635 to the Fairfax District was completed around 1976. Just north of the split with U.S. 69, signs advise motorists of the forthcoming directional T interchange (Exits 12A/B) with Interstate 29 & U.S. 71. 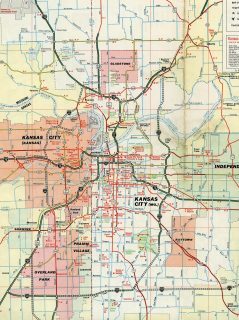 I-29 & U.S. 71 overlap southward to the Alphabet Loop (I-35 and I-70) at Downtown Kansas City and northward to the St. Joseph vicinity. Photo taken 10/30/16. Interstate 29 & U.S. 71 wind east through Gladstone to connect with Interstate 35 in 3.5 miles. I-35 ventures northeast to leave Kansas City via Claycomo and Liberty en route to Des Moines, Iowa. Photo taken 10/30/16. U.S. 169 previously overlapped with U.S. 69 north from 7th Street in Kansas City, Kansas across the Platte Purchase Bridge to Interstate 635 north. The route took a dog leg east from the end of I-635 to Arrowhead Trafficway via a short overlap with I-29 & U.S. 71 south. The route was relocated away from I-635 eastward to the Broadway Bridge in 1991 when toll collection ceased at the crossing. Photo taken by Michael Summa (1989). These button copy guide signs posted at the north end of Interstate 635 were replaced by the mid 2000s. Photo taken 10/17/04. Interstate 29 & U.S. 71 angles southeast along side Prairie View Road (former U.S. 71) to the small city of Houston Lake on the one mile approach to Exit 3C with Interstate 635 south. Photo taken 06/18/15. Interstate 635 curves southwest from Exit 3B through the city of Riverside, passing between Argosy Casino and Horizons Business Park with three interchanges ahead of the Missouri River bridge. Photo taken 10/30/16. The on-ramp from 56th Street adds an auxiliary lane to I-29 & U.S. 71 south to Interstate 635 south (Exit 3B). 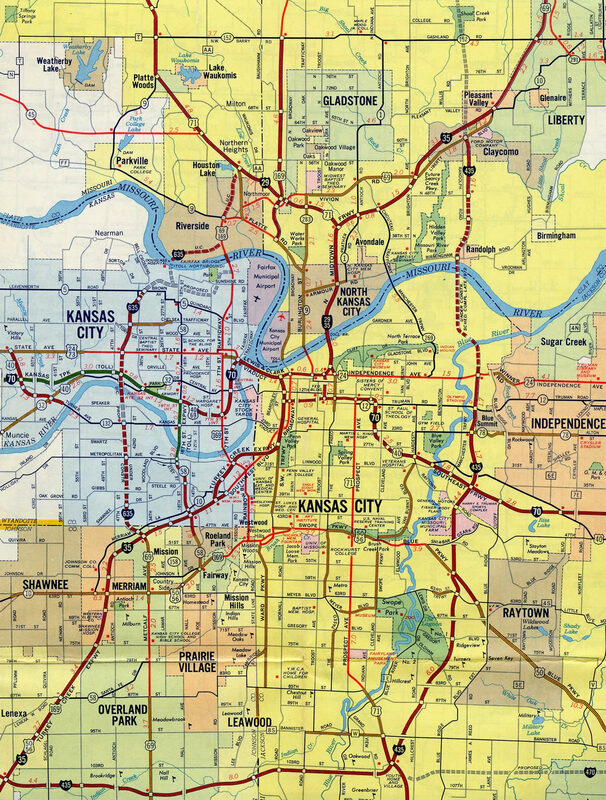 I-635 links Kansas City with the Fairfax Industrial District of Kansas City, Kansas after a 0.35-mile overlap with U.S. 69. Photo taken 10/30/16. Two lanes peel away from Interstate 29 & U.S. 71 south to Bethel-Welborn, Kensington and Argentine in Kansas City, Kansas. Exit 3C follows for Highway A (NW Gateway Avenue) south to U.S. 69 (Vivion Road) in Riverside. Photo taken 10/30/16. Previous guide signs for Interstate 635 on I-29 & U.S. 71 south paired the freeway with Highway A (NW Gateway Avenue). Photo taken by J.P. Nasiatka (05/01). After splitting from Interstate 35 beyond North Kansas City, Interstate 29 & U.S. 71 reaches Exit 1C for Oak Trafficway (Missouri 283). Two miles separate this four lane stretch of I-29 with the north end of Interstate 635 (Exit 3B). Photo taken 10/17/04. Interstate 29 & U.S. 71 progresses beyond the U.S. 169 freeway through the small city of Northmoor on the 0.75 mile approach to Interstate 635. This stretch of I-29 provides part of a bypass for long distance travelers bound for Interstate 35 south around Downtown Kansas City. Photo taken 10/17/04. The northbound freeway expands to four lanes in anticipation of the left-hand ramp (Exit 3B) for Interstate 635 south. I-635 also provides part of a through route for motorists headed west along the Kansas Turnpike to Topeka. Photo taken 10/17/04. Interstate 635 leads south through Riverside to cross the Missouri River into the Quindaro Bluffs area of Kansas City, Kansas. I-29 & U.S. 71 turn northwest to Platte Woods and Kansas City International Airport (MCI). Photo taken 06/19/15. The first shield for Interstate 635 is cosigned with U.S. 169; however, U.S. 169 has not overlapped with the freeway since 1991. Photo taken 10/17/04. Interstate 635 advances south from Shawnee Drive, three quarters of a mile to ramps for Interstate 35 and U.S. 69. I-35 connects Kansas City, Missouri to the east with Olathe, Gardner and Ottawa to the southwest. Photo taken 11/03/16. An auxiliary lane joins I-635 south from Shawnee Drive to Merriam Drive (Exit 1B) as the freeway approaches the Overland Park city limits and transition to U.S. 69 (Metcalf Avenue) south. Photo taken 11/03/16. Entering the folded diamond interchange (Exit 1B) with Merriam Drive west to Merriam and Merriam Drive east to Shawnee Heights in Kansas City. I-35 parallels Merriam Drive / Lane south to Shawnee Mission Parkway and north to Southwest Boulevard. Collectively the three roads represent the historic eastern extent of K-10. K-10 follows a freeway west from I-35 and I-435 to Lawrence now. Photo taken 11/03/16. Exit 1A carries motorists to left-hand on-ramps for Interstate 35. Des Moines is the northbound control city for I-35 from 119th Street in Olathe while Downtown Kansas City is still seven miles to the east from the concluding I-635. Photo taken 11/03/16. U.S. 69 splits with I-35 south to follow Metcalf Avenue from I-635 to Mission. The US route formerly followed Metcalf Avenue south throughout Overland Park. The route was relocated to an overlap with U.S. 56 & 169 west and I-35 south to Overland Parkway. Photo taken 11/03/16. Exit 1A separates within the Interstate 35 median. Emporia is a 100 mile drive to the southwest while Des Moines is 200 miles to the north. Photo taken 10/17/04. A left-hand on-ramp brings U.S. 69 south onto Metcalf Avenue ahead of an end shield for Interstate 635. Metcalf Avenue crosses Turkey Creek and climbs southward as a controlled access arterial to U.S. 56 & 169 (63rd Street). Photo taken 11/03/16. Interstate 35 curves east from Antioch Road and Turkey Creek to meet Interstate 635 north (Exit 231A) in 0.75 miles. Photo taken 06/19/15. A left-hand collector distributor roadway facilitates movements from I-635 south to I-35 north and from I-35 north to I-635 north. U.S. 69 ties in from Metcalf Avenue to the south, but without full access to Interstate 35. Photo taken 06/19/15. Interstate 635 arcs north through Kansas City, Kansas to provide a direct route to the BNSF yard, I-70 at Coronado and I-29 north to KCI Airport. Photo taken 06/19/15. The first in a series of diagrammatic signs outlines the left-hand ramps for both Interstate 635 north back into Kansas City and U.S. 69 south into Overland Park. Photo taken 10/31/16. The forthcoming exchange (Exits 231B/A) with Metcalf Avenue preexists Interstate 635 north. Ramps previously connected with parallel Merriam Drive (former K-10) just to the north. Photo taken 11/03/16. The roadways of Interstate 35 diverge to accommodate a left hand ramps to and from I-635 and Metcalf Avenue. U.S. 69 follows Metcalf Avenue south to Mission and Shawnee Mission Parkway (U.S. 56 & 169). U.S. 69 returns to I-35 at Exit 228B. Photo taken 10/31/16. Interstate 635 leads back north into Kansas City, Kansas, as I-35 curves southwest along the Turkey Creek Expressway to Merriam, Shawnee and Lenexa. Photo taken 10/31/16. U.S. 69 (Metcalf Avenue) straddles the Overland Park and Mission city line to the freeway beginning of Interstate 635 north. Photo taken 11/03/16. The roadways of U.S. 69 separate to a left-hand turn for 52nd Street and a right-hand on-ramp to Interstate 35 north. U.S. 69 follows I-35 east from I-635 to the 18th Street Expressway. The two routes parallel one another north through Kansas City, Kansas to Riverside, Missouri. Photo taken 11/03/16. U.S. 69 and Interstate 635 come together with I-35 at an antiquated interchange with left-hand ramps. I-635 enters Kansas City just north of Merriam Drive (old K-10) at the Argentine and Turner neighborhoods. Photo taken 11/03/16. Interstate system route numbering web site http://www.nwindianahwys.homestead.com/INTER_MAIN.HTML, Stephen Summers. “The new interchange on Interstate 635 leading to Horizons Parkway should be open by the second week of December, Riverside and state transportation.” The Kansas City Star, October 31, 2007. Page updated November 8, 2016.